The very large (wide not tall) building just above the wheel is the West Concourse of the Orange County Convention Center (where I work). 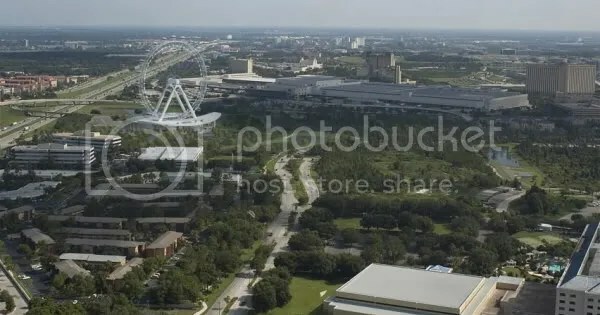 The road in the upper left is I4 and the overpass you see is the end of the Bee Line Beach Line (I hate that name) lets just call it the 528. Are they really comparing it to the Louvre? The Eiffell Tower? Champs Elysees? Big Ben? The Golden Gate Bridge? Etc?? ?